Wisconsin business, bb7, collaborates with brewery to create a beer featuring bb7-harvested honey. bb7 is known as the solution for product development: Consulting, training, staffing and providing product development services in research, design, engineering, prototyping and testing. Based in Madison, Wisconsin, their local reputation for daring internal projects is growing. Since 2012, bb7 has owned and operated their own bb7-branded beehives. “We chose bees for many reasons: Bees are an homage to our new name (we were formerly Bjorksten Bit 7), and the beehive represents our collaborative style. Just like our hives, bb7 is buzzing with a group of organized and industrious team members. Just like bees, we work together towards one goal: to produce something rewarding,” said Ben Paprocki, Vice President of Operations, bb7. bb7’s long list of clients have enjoyed their annual “taste of honey” – a sampling of bb7’s honey in bb7 designed & developed packaging. However, in 2013, the bees only produced a few pounds of product – a contrast to the 100 quarts of honey harvested in prior seasons. The shortage limited the amount of honey to allocate to partners and clients in 2014/2015. “In the product world, successful developers are the ones that find opportunities where others find barriers. Our chemists (who do not shudder in the face of obstacles) suggested that we use the honey as a key ingredient to something else. In true bb7 fashion, we sent our technical leads into the field with a mission: Return with the best complement to our honey! The jury agreed on honey and beer – narrowly beating honey and chocolate,” said Jim Frater, bb7 Founder. House of Brews and bb7 went through many iterations of fermentation before selecting the new Honey Rye Beer. bb7’s beer-tasting committee was relentless in their pursuit of the ideal brew (and potentially the pursuit of continued beer sampling). This specialty brew is a balanced libation with the right mix of tartness, sweetness, and hops. The entire batch required a gallon of bb7 honey. bb7’s industrial design team (who have experience in consumer product packaging design) created unique packaging for the new beer which comes with a small bb7 beer glass. The package is hexagonal to reflect the honeycombs. 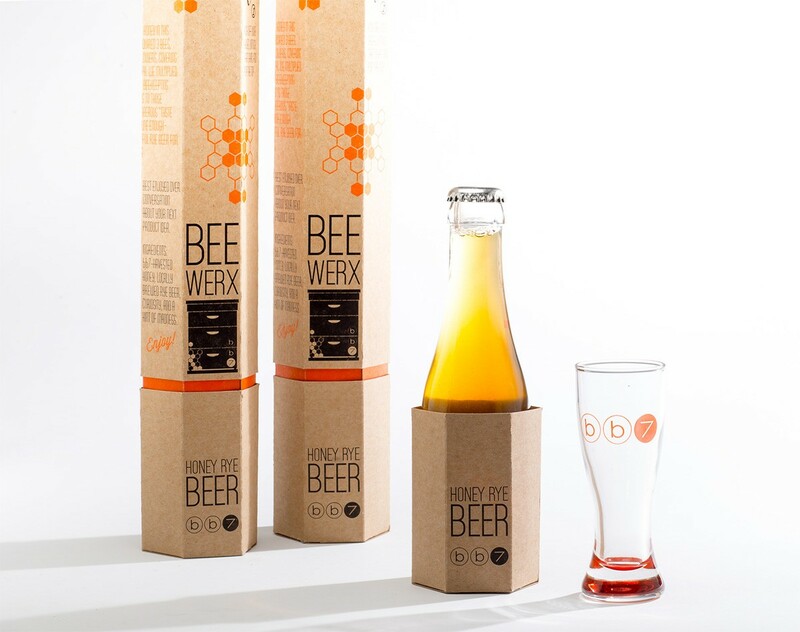 Further, the unique package design is able to hold and protect both the glass beer bottle and the beer glass. The limited edition bb7 Honey Rye Beer is only available to bb7 staff, clients and partners. “If you want a taste of the bb7 magic, we invite you to schedule a visit to our facility. Not only will you sample our beer, but you’ll get a taste of comprehensive product development,” said Maggie Graham, bb7’s Marketing Manager. – Jim Frater, bb7 Founder. Bob Schofield has been running with scissors since 1975.